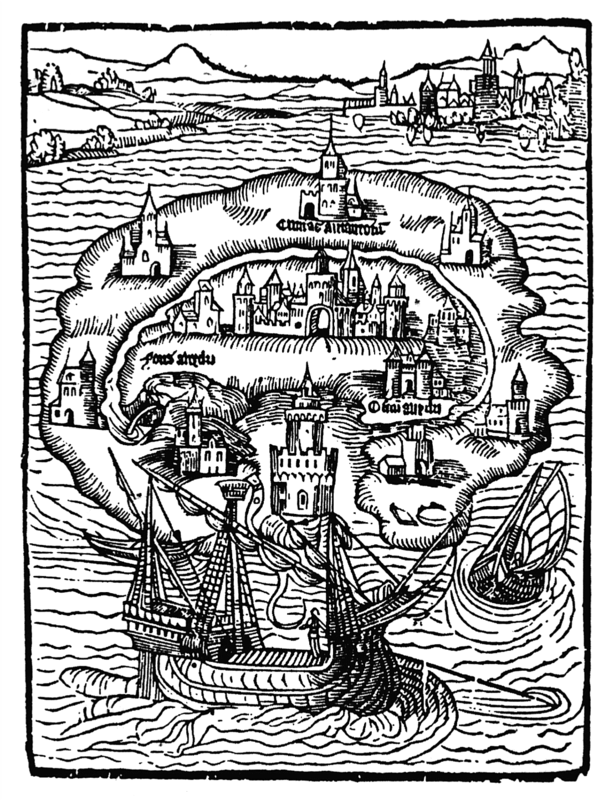 ‘Historical utopias’ as Weber called them are heuristic devices. Such a way of looking at heterotopia chimes with the way I see these spaces as both a method and object of study. I know the context of Wittgenstein’s thought on family resemblance and Weber’s thought on ideal types is very different from Foucault’s discussion, but both capture the relational dimension of heterotopia. Perhaps they do not exist except in relation to each other. Abstract: Described as the epoch of space, the twentieth century saw much of its cultural and film theory immersed in questions related to this phenomenon. Matka, with its careful spatial organization, encourages an interpretation that revisits and contests the familiar opposition between nature and culture through the concept of heterotopia. An exhibition running until January 2014 at Trondheim Kunstmuseum, Norway. OF VOYAGES, OF OTHER PLACES by John Murphy. 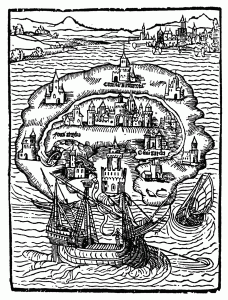 Woodcut of the island of Utopia on frontispiece of the 1st edition of Thomas More’s Utopia 1516. Foucault discusses the heterotopias, spaces of otherness, which are neither here nor there. These spaces can be both physical and mental at the same time, like the space for a phone call, or the room in a mirror, or take the doctor’s waiting room or the space behind the bordello’s curtains. These spaces do not only resist simple definitions, they are also what Foucault calls our ‘greatest reserve of imagination’. Imagine the ship, the foremost heterotopia, moving across the water but at the same time a space without a space, a space of it’s own, exiting the imagination. Maybe we also should regard the exhibition space as heterotopia”. When: Wednesday,6 November – Friday, 8 November 2013. Where: Ernst-Bloch-Zentrum, Ludwigshafen am Rhein, Germany.